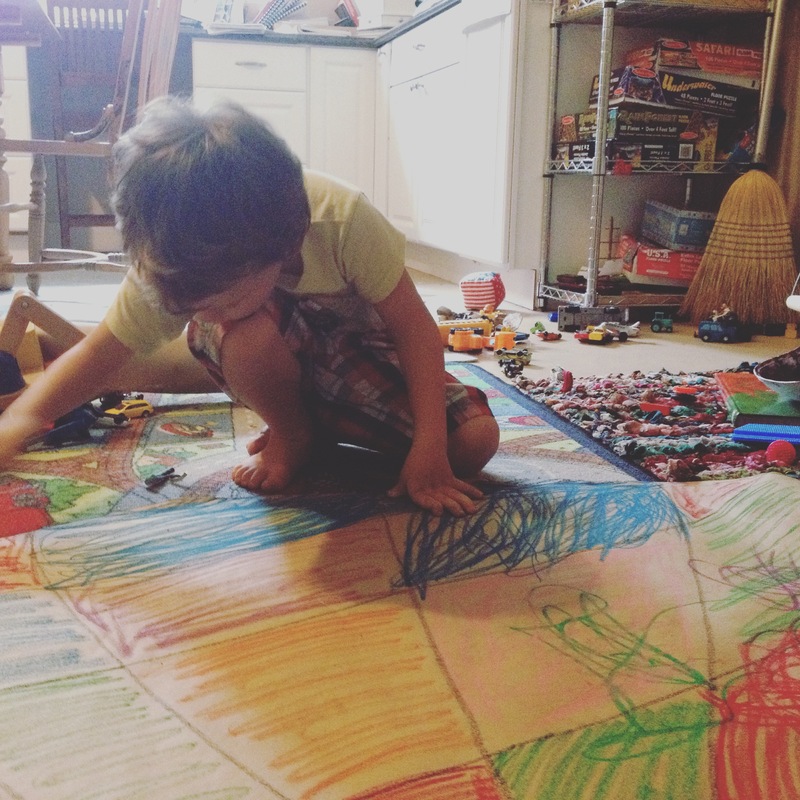 The Wonder of Child-led Play. See the joy? Its catching. My littles spent three days OBSESSED with parachutes. I could not get them to even glance twice at hot air balloons. How could they not want to learn about hot air balloons? Its the first picture in the curriculum! What is happening? I almost, almost, had a Type A panic attack. I decided early on to surrender this year. 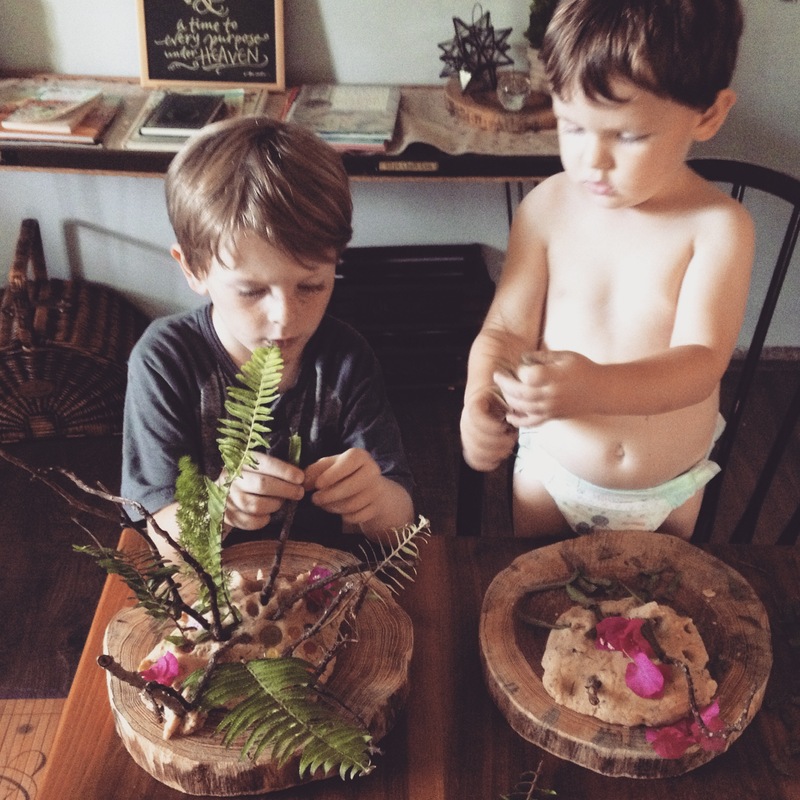 I want the boys to experience child-led play, not mom-led agendas. It will look different from the picture in the book. It will be unspeakably messy. It will absorb their thoughts and mesmerize them as they sink into it. It will be unpredictable. This is more than ok. It is glorious. So we got to work. He gave me directions. Cut this way. Draw these lines. Then we colored in each block. “It has to go in my room!” he shouted. We went to the nursery and took the decorations down off one wall. Decorations that pleased my aesthetic but held no value for him. We put up his creation and admired it together. 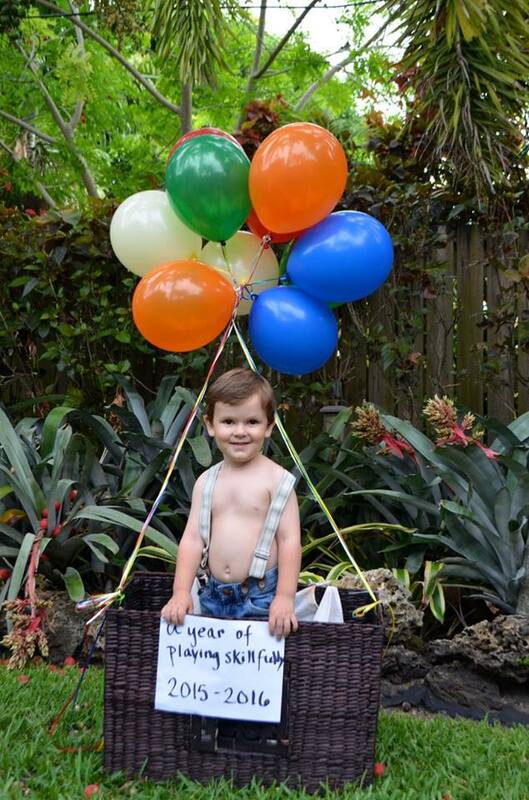 “Can this ballon stay here all year long? And then everything we learn we can put up right next to it?” He was wide-eyed with barely contained glee. 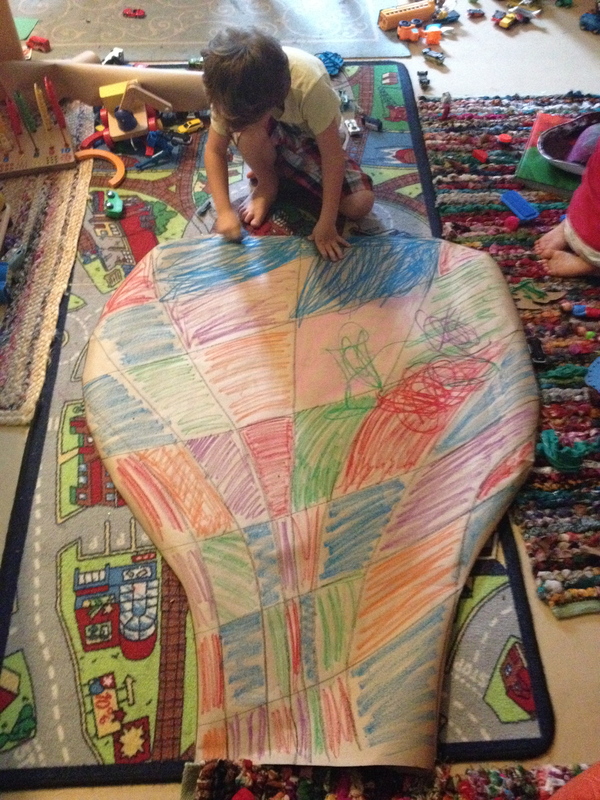 Yes, we gave our preschoolers freedom to decorate their own room with all the things they are discovering. They are making plans to add coffee filter flowers and a book basket for all the books they will be making this year. By the end of the year it will be a spectacular, beautiful mess. I fully anticipate holes, glue residue and staples to litter this wall. 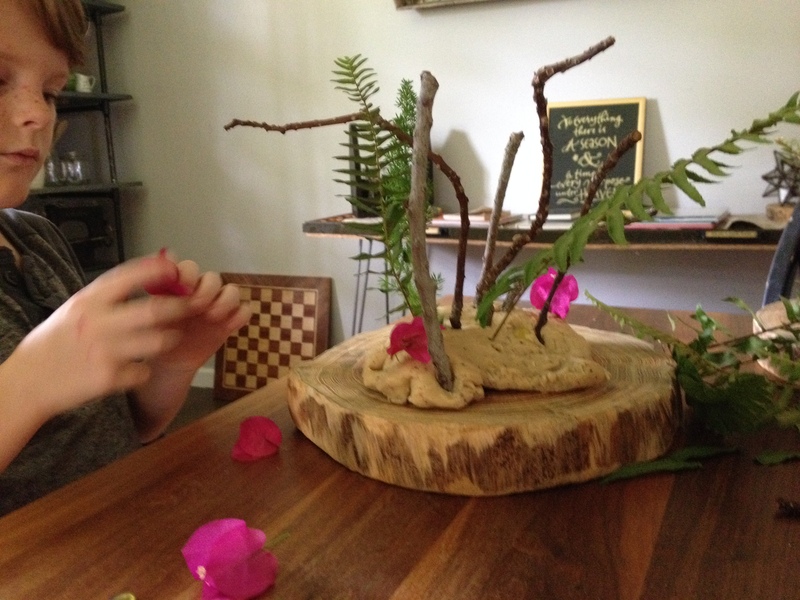 After we made our nesting world, we realized that it really needed an additional circle, “My Room,” this small space that is their domain and holds so much importance for them. The rhetoric around here is changing. Not just in deciding to “say yes” more often. The boys have taken ownership of their surroundings. Learning to say “please” and “thank you” has quickly evolved into learning how to unstack the dishwasher, feeding the dog, making the bed and throwing shreds of paper in the trash. This should not surprise me. 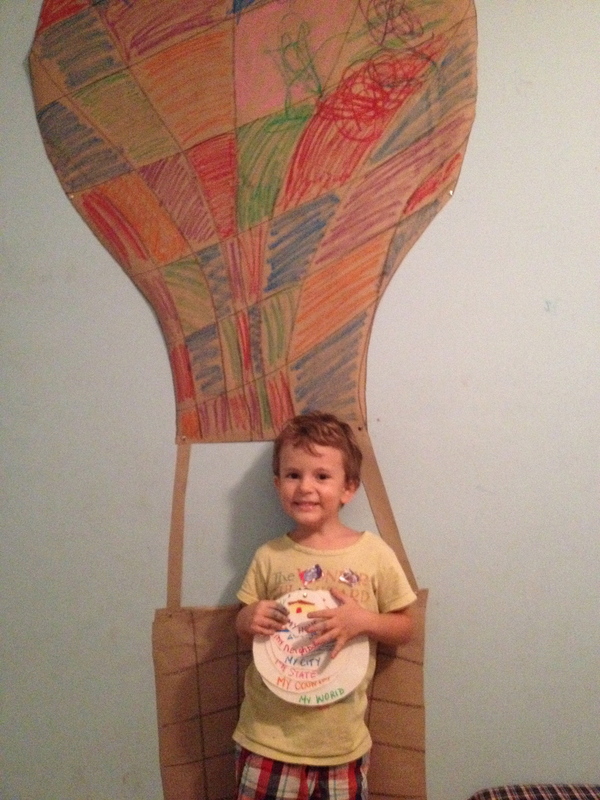 After all, play is the hot air balloon that can take you far beyond your wildest dreams. When I first opened the curriculum I wondered why we weren’t given specific tasks for each day. Now I know. This cannot be tethered or outlined. These little-big imaginations run the schedule. How fantastic to see where the sparks fly and what they bring us to next. One question leads to a whole other avenue of exploration. 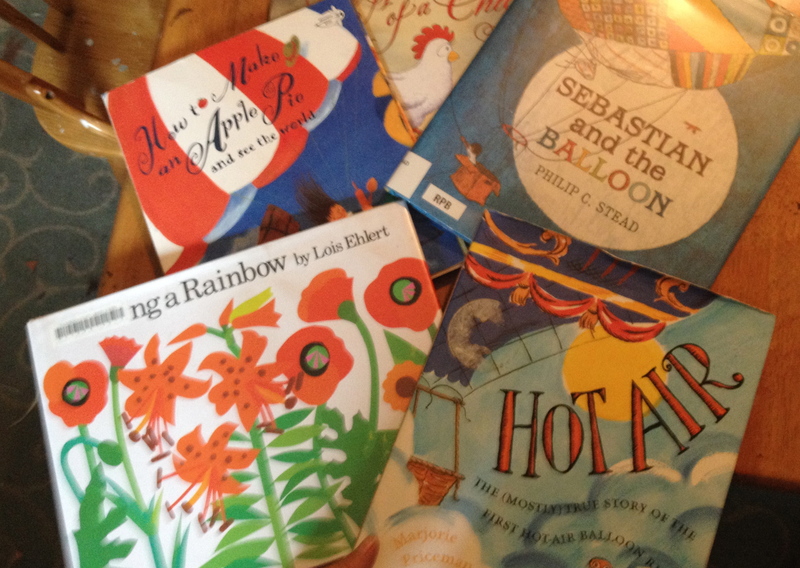 I show them colorful balloons and before I know it we have spent three days with Lois Elhert, planting a rainbow. Then we are off around the around the world, finding ingredients to bake an apple pie. I remind myself everyday, “Hands off those imaginations! Let them be little and let them be!” We still have our rhythm, but there exists another rhythm within that is entirely of their own making. Our little sensory seeker is pleased as punch with his herbal playdoh. 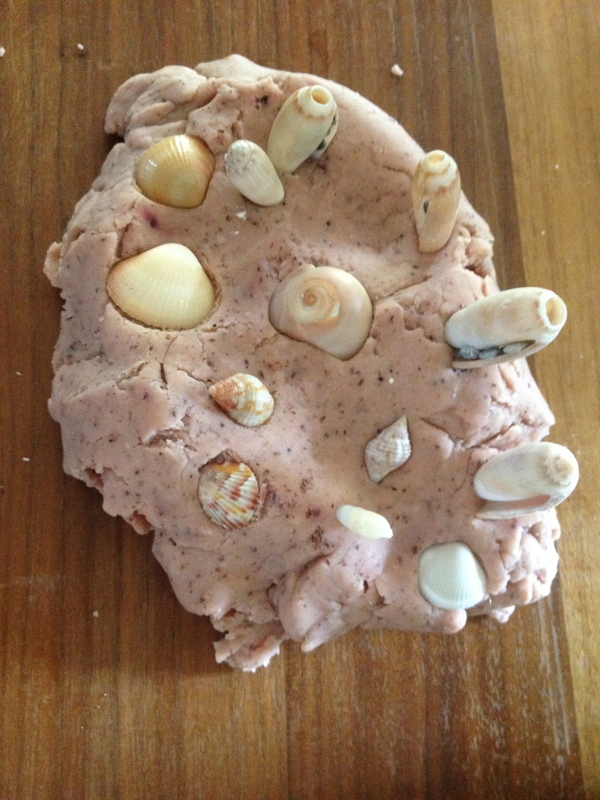 He was hesitant at first, so I set the playdoh down on a wood slice and walked away. A few minutes later I walked by and he was standing at the table, eye level with the herbal doh. Three minutes later he was sniffing its yummy cinnamon-apple scent. Soon he was poking one finger slowly into the warm center of the freshly made doh. I brought down a basket of items I had asked my elder children to collect. Then my second-born son (who is also my little guy’s BEST BUD!) sat down next to him and started to play. Soon they were both engaged in deep play. Forty minutes later the little guy wandered off. My six year old kept on playing. The seven year old stopped by and joined him. The four year old, having had his middle-child “someone is having fun without me” radar sound off, soon joined in as well. The littlest came back with him. They played for hours. Deep, deep, engaged play. I washed dishes. I folded laundry. I swept the floor. They played. They played inside stories. They played new kingdom orders. They made tiny motorcycles for Ralph S. Mouse. They made plates and cups for Violet and the rest of the Boxcar children. They made snozzcumbers and Wonka bars. They made tiny shields for an invisible army on the brink of war with Uther Pendragon. Our youngest sat mesmerized by a ball of doh. Rolling it back and forth. Learning how applied pressure would change its shape. Many, many levels of play and learning occurred without a word or suggestion from me. 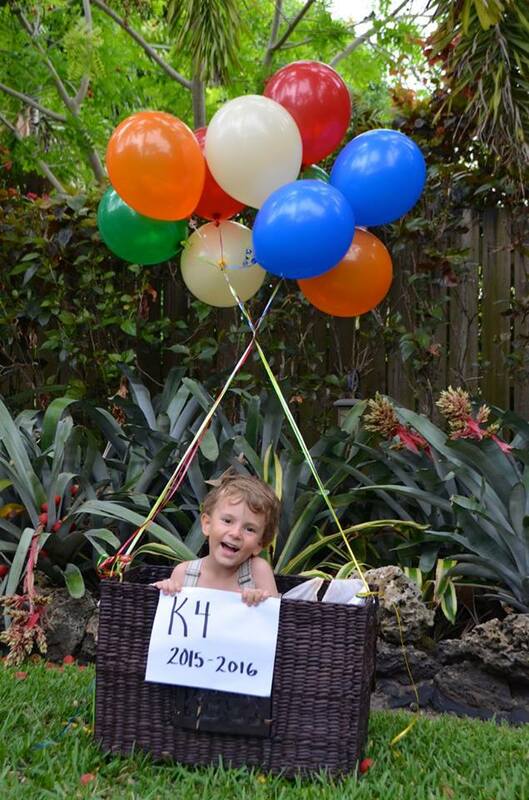 My eldest boys are currently in 2nd grade. They have not shown the least hesitation in joining in their little brothers’ curriculum. Far from it. I often hear the phrase, “Need me to test that out before you give it to Team B?” They were yearning for this kind of play and I didn’t see it before. They played, but not to this degree. “A Year of Playing Skillfully” is geared for children 3-7. I wondered if Team A would bite. They did. They are soaking it in every chance they get! I love seeing them play. In a world where kids are forced to grow up at a break neck pace, its good to see innocence thriving. This world may be going crazy, but my kids can still be kids. 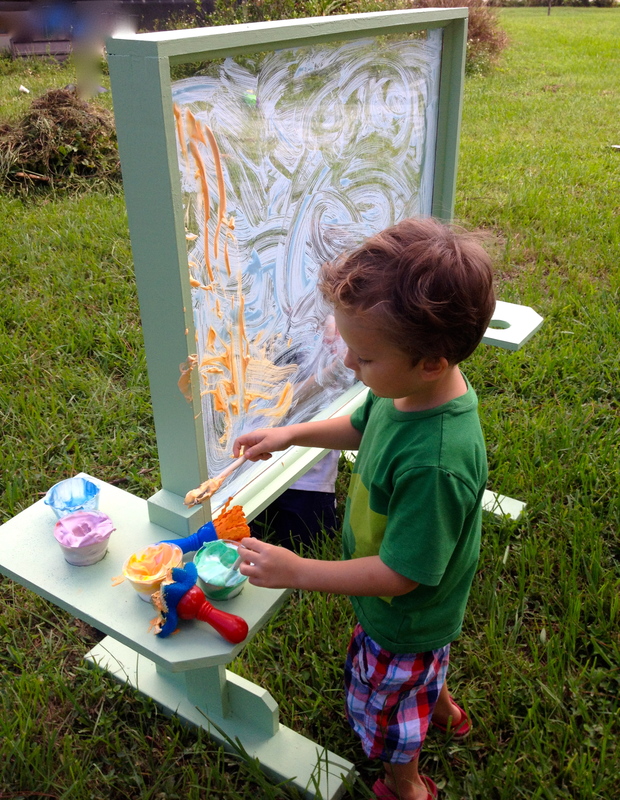 My husband did a lovely job building our sensory table and plexiglass easel. The boys love playing with it! We have a lot of eager hands, so I requested three bins for our sensory table. 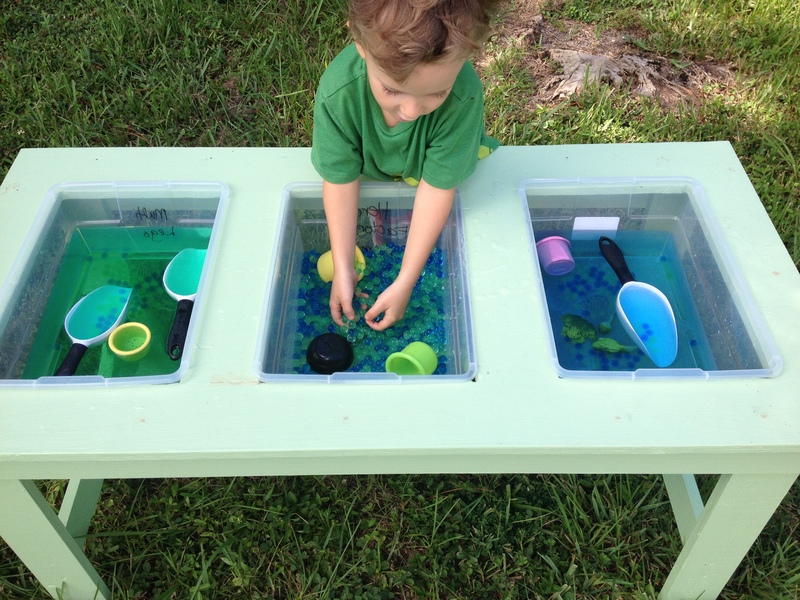 For our pond play, I stirred up a tub of green water and left it in the sun to heat up. I put lots of ice in the blue water. 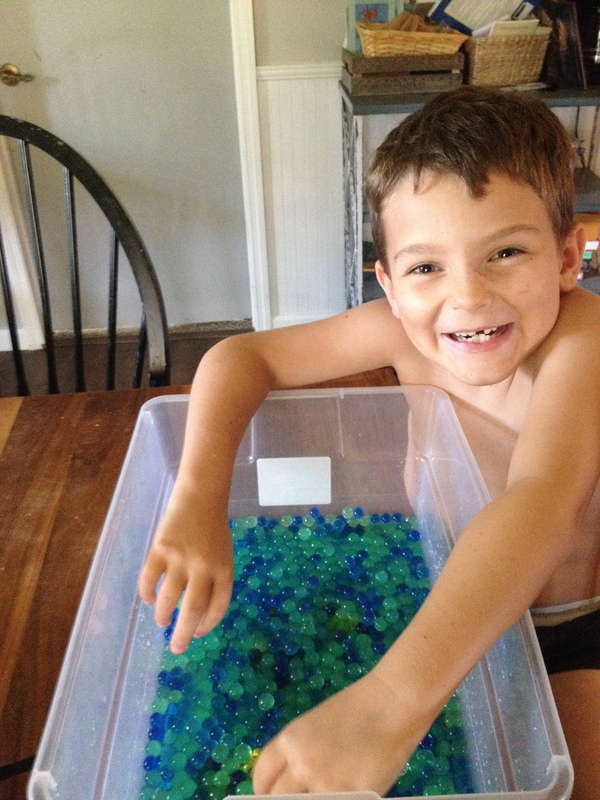 The middle bin held our water beads and our frog life cycle figures. I loved hearing the surprise in their voices as they beheld the table and discovered the varying temperatures. I also loved how down right dirty and disgusting they got. Whenever its nearly time to go back inside, I love to ask, “Are you dirty enough yet?” They always say “NO!” even if they are absolutely filthy. “No! We can get dirtier!” Then they go and find the last few specks of dirt they had yet to discover and drag it inside with them. I’m a big fan of hosing them off before they enter. I’m also a big fan of Oxiclean detergent. We are spending more and more time outside each day as the unbearable heat of summer dwindles. Pretty soon our main outdoor months will arrive and we will be outside the majority of the day. How I am looking forward to it! Exchanging anxiety for joy–what a life giving act. I thought my year would be one of sadness and regret. Instead it is unfurling into joy and peace. This week, I corresponded with a dear friend about mothering and childhood and the difficulty of battling our insecurities and feelings of failure. I shared that I had stopped looking at my boy’s childhood as the top of an hourglass, sand slowly trickling away. In saying “yes” I have set my gaze on the hourglass as the sand builds, each grain that falls, each day that passes, I am watching my children grow into who they will become. I am not losing, I am gaining. The ball is rolling. The “YES” answers keep coming. These boys are growing their wonder. < Previous Why We Said YES! You are my hero. You have brought my heart so much joy I cannot even express it. I can see that every minute I’ve spent pouring my heart out has been worth it. Huge hugs to you and yours. 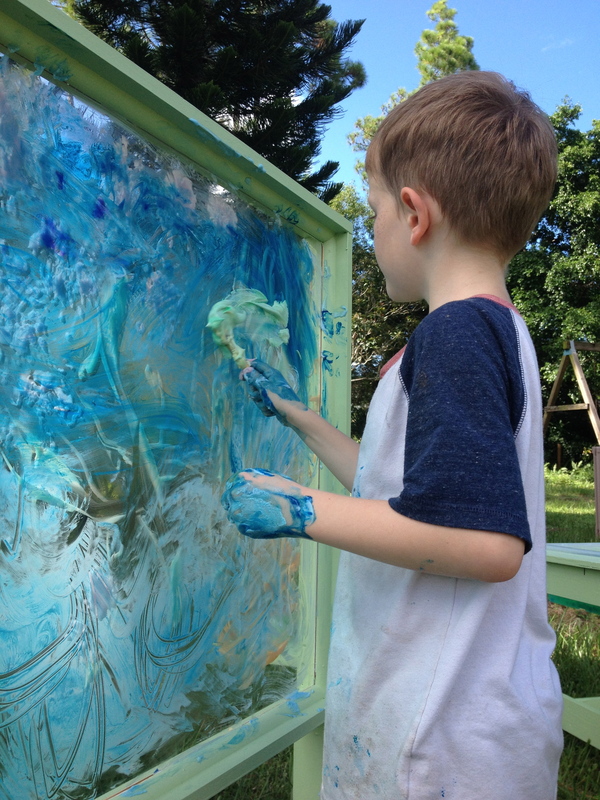 How did you make that “foamy paint” for the sensory painting easel? 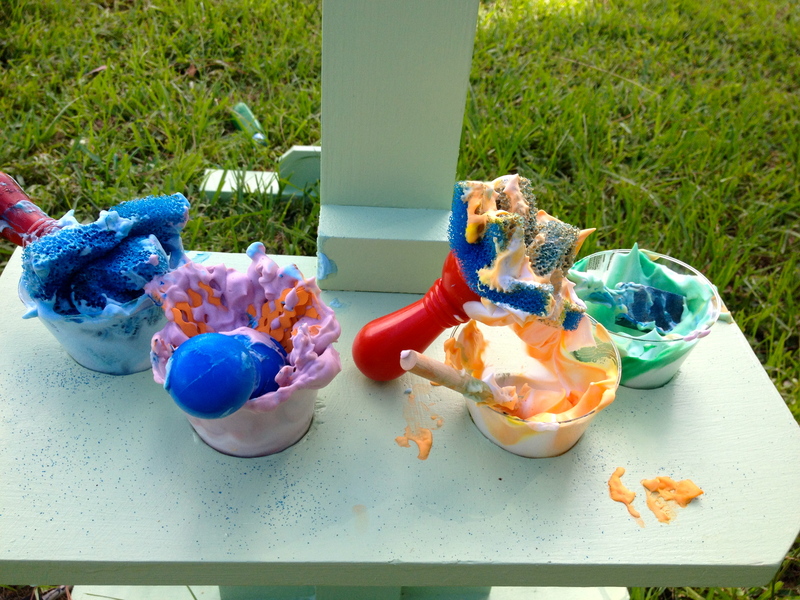 Is it shaving cream and food coloring? 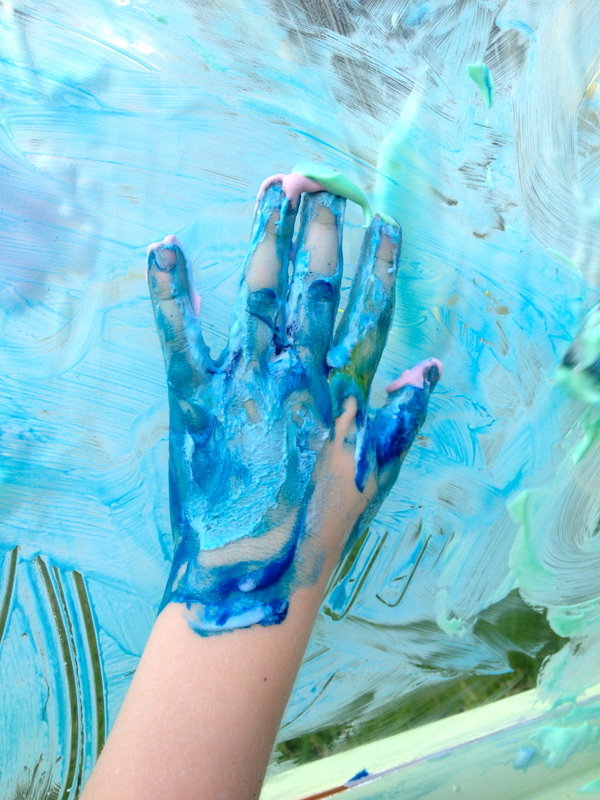 Could we also use regular washable paint? Hi there! I just found your blog and instagram and am so encouraged and inspired! I have a 4.5 year old girl who will be starting kindergarten this fall and twin boys who are turning 2 in a couple of months and will be 2.5 years old this fall. 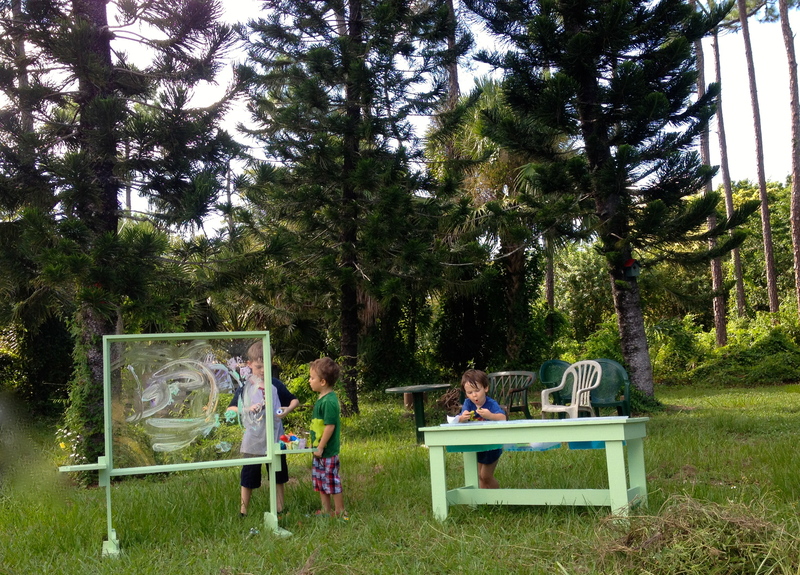 I work full time but have seriously been considering homeschooling them come fall. It sounds like you are really enjoying the Homegrown Preschooler program. And I also read another post where you’re now taking your kindergartener through MFW Kinder program. Would you recommend that I do these two different curriculums for the two age groups? 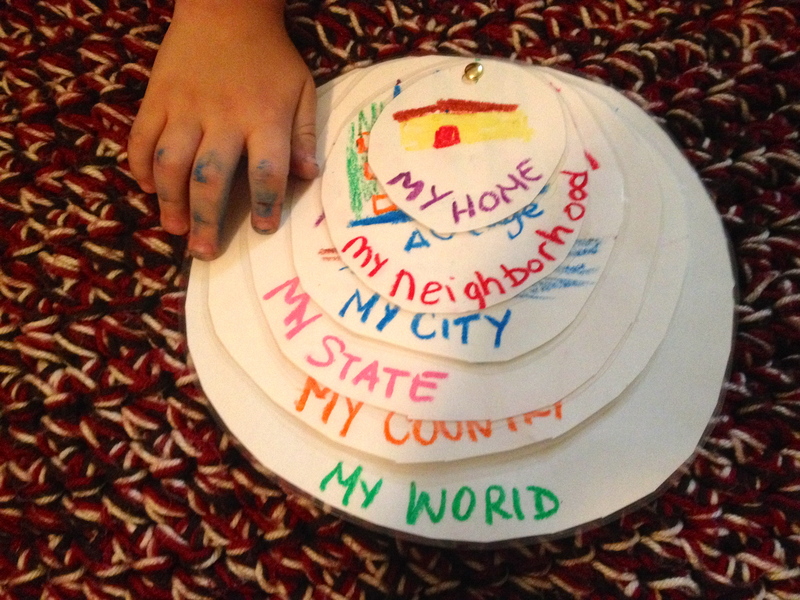 Would it make sense to have the 5 year old get started on MFW and she can participate in different activities with her brothers from the homegrown preschool program when she can? Any insights would be much appreciated! !